Every kid’s dream come true. 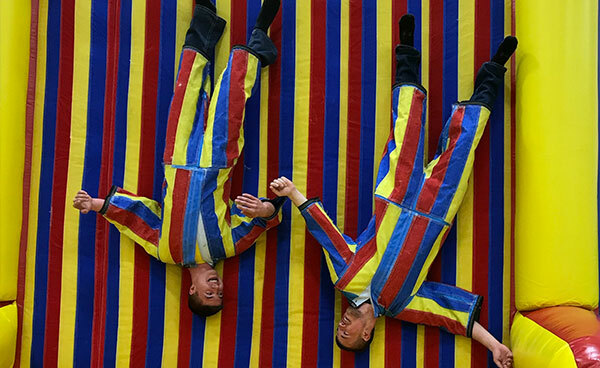 Put on your velcro-covered suit, then run, jump, spring, and stick yourself as high up on the Velcro Wall as you can! 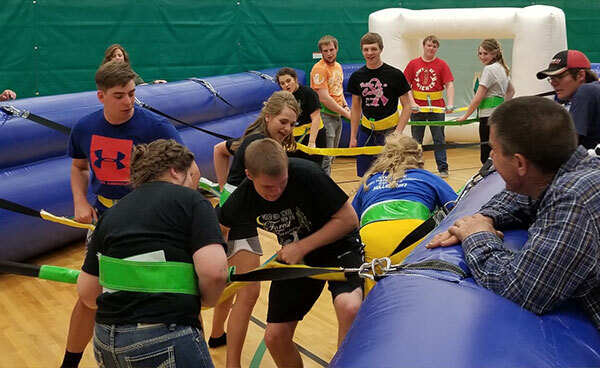 The Velcro Wall is super fun and challenging for both the participants and the spectators. A range of velcro suit sizes are available from young children to adults. Prove that you’re better than a tiny stiff plastic man. You’re probably familiar with the classic table top game of foosball. Now picture this – YOU are the player in the arena, with 6 other people on your team, working together to control the ball. Both hands on the bar at all times. Have a great time. Respect each other. These are the basic rules of human foosball. Big hits without the concussions! Knocker Ball has been called Bubble Soccer, Bubble Ball and Knocker Soccer. Whatever you call it, the contact play is fun and safe! Collisions are big and indoor and outdoor play is offered and can accommodate all ages (4 yrs. +) and both genders for those who want to play together, laugh together or knock each other around. Plus, options for kids who are afraid of Santa! Add a costume character to your event to make those kids never forget the great time they had! We can drop by for a little bit, do a simple meet and greet or full event entertainment! 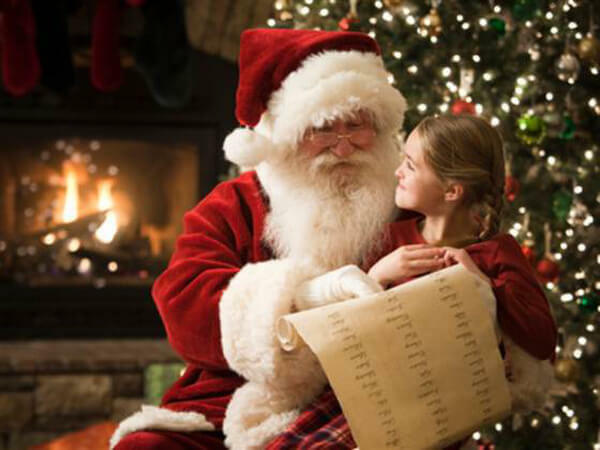 From Santa for Christmas or Elmo at your birthday party, we have lots of different characters to choose from, so contact us for more info! Add some fun and get a costume character at your next party! Guaranteed to make you dance like Timberlake. Due to demand, we’ve invested in one of the most awesome ways to draw attention! You’ve seen wavy arm guyed flailing tube men or ‘air dancers’ on television and on commercials – now use them to your advantage. They stand tall at 18 feet with and come in a number of bright colors. They’ll certainly draw attention of anyone passing by. Use them for any event or special occasion. Lots of fun even if you take games too seriously! VanMeter Entertainment can provide a number of options including all your favorite game shows. It’ll be fun for everyone – perfect for your company event, school dance, wedding rehearsal or Christmas party. We’ll customize the event to your party. Just reach out to get it started! Add these colorful signs on your big day! 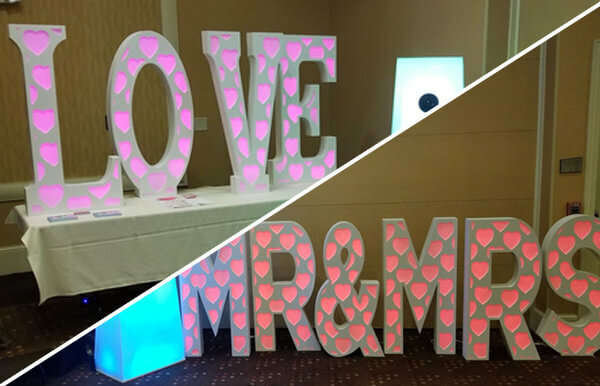 Add some pop to your wedding reception with our oversized signs. They are lit with brilliant LED bulbs, can be set to display in one color, fade or strobe. You can choose from plenty of color options, so your signs will match your wedding’s theme and decor! Same rules, just on a larger scale! Hungry hippos was probably the first game that you mastered as a kid. Now that you’re grown, it only makes sense that you’d take it to another level. 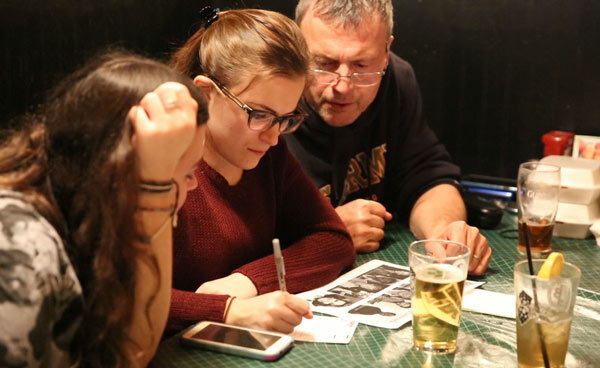 Challenge your friends or frenemies and get into the game. It’ll be the funnest thing you do at the party, guaranteed! In the theme of making the best games life size, we introduce the human size whack a mole! We don’t even have to tell you how it works, because you figured it out just by looking at it! 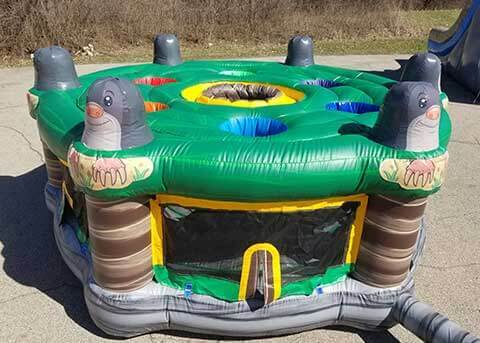 Rent this for your event and people will have the time of their lives!! VanMeter Entertainment is nearly ready to unveil our outrageous spin on the ever-popular stage hypnosis show. Just give us a call to get pricing and availability!